We celebrate Black Friday with a twofer, "Conservative Pundit Admits Republicans Lie About Everything," and "Crazy Conservative Contradictions." The first article is by Randle Aubrey at Addictinginfo.org, and the second is by Justin "Filthy Liberal Scum" Rosario at the same site. Both articles illustrate our main thesis that Conservatism, through their front group, the Republican Party, MUST lie to voters. We've learned over the past year how Conservatives must continually lie and dream up false issues that the leadership places little credence in, just for the consumption of their Sheeplets. Did right-wing pundit Ben Domenech just tell MSNBC’s Chris Hayes the GOP is built on a foundation of lies? Here’s a moment the liberal media missed. Photo from Ben Domenech’s facebook page. "Paper Tiger Politics: Conservative Pundit Admits Republicans Lie About Everything." "But the clock ran out before Chris Hayes could address an even more striking remark from Ben Domenech. "I’ve got to hand it to Hayes for taking Ben Domenech to task; the journalists who do are canaries in a coal mine, their career deaths a warning to the others to either turn back or tread lightly. Sadly, his question was asked in the relatively safe, final moments before commercial, failing to leave time for Domenech’s even more striking admission to be properly addressed. 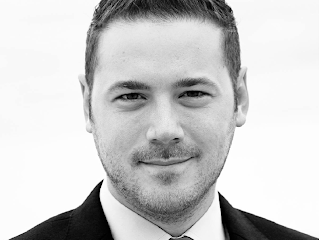 "Did Ben Domenech just say the Republican party is built on a foundation of lies? "While Ben Domenech’s words are somewhat convoluted from a certain degree of backpedaling, their meaning their meaning should be quite clear. 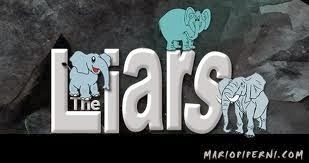 The Republican party is built on a foundation of lies, and they lie about everything, even when they don’t have to. 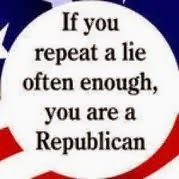 As a party that defines themselves not by what they are for but what they are against, without their lies, the Republicans have nothing. Nearly every policy position they have put forward in recent decades has done massive damage to our economy and our prosperity. In addition, GOP-led policies have caused incalculable human suffering both here and abroad. Ben Domenech and other right wingers cannot ever admit to this, for to do so would seal their doom. This is why conservatives have shifted the debate away from ideas and over to facts in the public square; doing so allows them to maintain an appearance of being selfless and productive, while making sure their paper tiger politics still have teeth. "Ben Domenech’s remarks seem to have gone largely unnoticed in the liberal community. One can never predict what will go viral in the Digital Age, but I believe it’s safe to say that, regardless of the level of exposure this nugget of truth receives, this misstep will condemn him to a life of political obscurity from now on. After all, glitches in the Matrix cannot be tolerated, even minor ones. Rest assured, there’s a wide, shallow pool of conserva-clones waiting to take his place, and each one of them in turn will eventually become a glitch in the narrative. But as long as we keep track of these aberrations as they occur, and add them to the growing list of right-wingers caught in their own web of lies, we can, in time, pin the paper tiger to the wall." 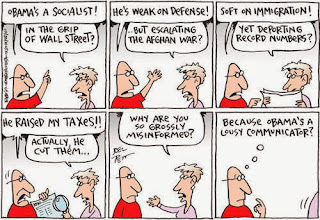 "The Conservative Contradiction: Corporations only exist to make money. You cannot expect them to do anything that will interfere with the bottom line. They cannot concern themselves with environmental issues or customer safety if it is more profitable to ignore them. You, as the consumer, need to be more careful! "2. Corporations should have all the rights of a person. They should be free to exercise their First Amendment rights and buy influence elections just like any other citizen of the United States. "The Conservative Contradiction: Corporations are not people so they cannot be treated like any other citizen of the United States. You can’t arrest them for manslaughter or negligent homicide even if they DID add known carcinogens to that baby food on purpose. "Ultimate Contradiction: Unions (basically, a group of people pooling their resources) should not be allowed to influence elections. It corrupts the democratic process. "3. You should never try to organize labor. That’s selfish. Unions extort money from corporations, inflate the salaries of workers and give them unearned benefits like maternity leave and pensions. Union workers are greedy and do not care about the companies they work for. The fact that they are paid so well is a sure sign that they are wrong. "The Conservative Contradiction: How dare you try to limit CEO pay and severance packages?! Those people work hard and earn every penny they get, even if they drove the company right into bankruptcy! So what if they took billions of tax payers’ money to stay afloat, they still deserve those bonuses! "4. All liberal celebrities should shut the hell up. They don’t know what they’re talking about and should leave politics to politicians. Liberal celebrities aren’t real Americans anyway because they’re from Hollywood! "The Conservative Contradiction: Here to explain to you how liberal policies are unpatriotic and probably illegal are Victoria Jackson, Kelsey Grammer and Jon Voight. "5. The Government cannot create any jobs at all and can never reduce unemployment, only the private sector can do that. "The Conservative Contradiction: The Government has too many people on its payroll; we have to reduce the number of public sector jobs. "Ultimate Contradiction: See how many public sector jobs we’ve lost under Obama? He made unemployment worse! "6. We really invaded Iraq to get rid of a terrible dictator and it had nothing to do with 9/11. "The Conservative Contradiction: Why is Obama invading Libya?! To take down a terrible dictator?! How is that our problem?! "7. Osama bin Laden was responsible for 9/11 because he gave the order to carry out the attack. "The Conservative Contradiction: President Obama can’t take ANY credit for the death of Osama bin Laden because all he did was give the order to carry out the attack. "8. 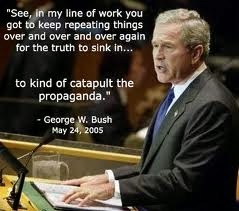 Any journalist, politician or private citizen that questions President Bush during a time of war is a traitor. "The Conservative Contradiction: During this time of war it is our patriotic duty to question President Obama about every little detail of his agenda. "9. Providing billions in tax-payer money to people in dire financial straits is Socialism and will lead to the destruction of the country. "The Conservative Contradiction: Providing trillions in tax-payer money to banks in dire financial straits is Capitalism and will lead to the salvation of the country. "10. We must protect innocent fetuses by any means necessary. Terrorism and assassination is justifiable because we are protecting children! "The Conservative Contradiction: Providing pregnant women with medical care and proper nutrition is a burden on the tax-payers and we can’t afford it. We need that money to fight terrorism! "11. Islam is a religion of terrorists! They murder innocents in the name of Allah and that’s just wrong! That’s why we’re better than they are! "The Conservative Contradiction: All homosexuals should be put to death! They are the work of Satan! If we cannot pray away their gay then we must do as the Jayzus commands and stone them to death! "12. My freedom of religion is absolute! It says so right there in the Constitution! You can’t restrict my right to worship where and how I want! "The Conservative Contradiction: Those damn Muslims keep putting up mosques wherever the hell they want! Who do they think they are?! That should be illegal! "13. 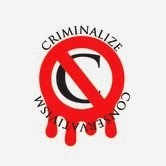 The Constitution is inviolate! Why are liberals always trying to shred the Constitution?! "The Conservative Contradiction: We should just ignore the 14th Amendment! It allows anchor and terror babies! We have to protect ourselves from the furrners! "14. Damn liberals always trying to select activist judges that will just 'interpret' the Constitution however they want to fit their Socialist agenda! The Founding Fathers knew what they were doing and we should also follow their intent, not just make it up as we go along! "The Conservative Contradiction: Citizens United? I think the Supreme Court did a fine job of interpreting the Constitution to fit our much more complex times, don’t you? Yup, the GOP is "built on a foundation of lies, and they lie about everything, even when they don’t have to," according to their own spokesperson. And like all lies they come back to chomp on the liar's posterior. We can take that statement and extrapolate two things from it to understand what Conservatives say each and every day: 1.) 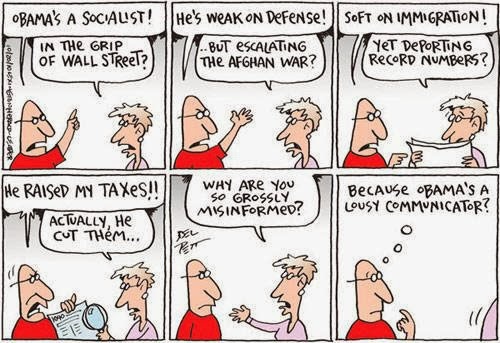 Everything a Conservative says is a lie, because 2.) Conservatism is the mouthpiece of the richest and greediest among us. One of the more interesting contradictions in number 10 illustrates yet again why there is no compromise on the abortion issue: Progressives wonder how Conservatives can rail against abortion, yet kill infants through taking away funds for their care, and Conservatives maintain that they wonder why Progressives want more funds for infant care while killing the unborn. And the answer lies in the definition of a viable life, already settled law by the Supreme Court in Roe v. Wade, yet like any law they hate, it is a law that they relentlessly seek to dismantle. This leads us to number 14, where we see that Conservatives always try to break the laws they and their corporate masters don't agree on.